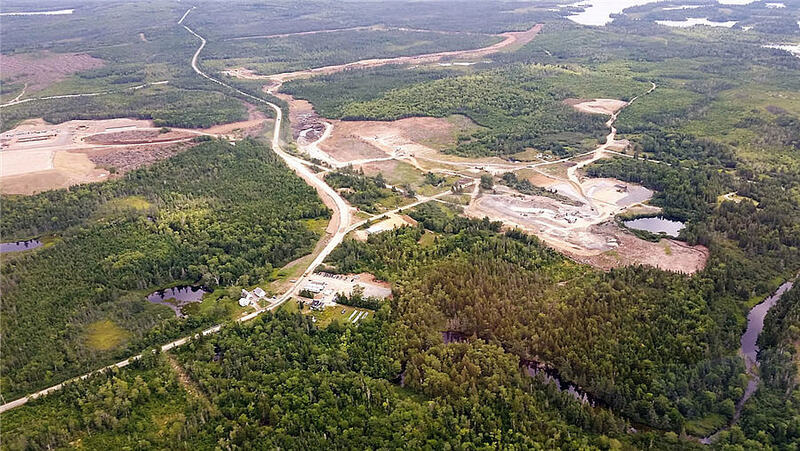 Aerial view of Moose River Consolidated gold mine 57 km's from Fifteen Mile Stream - Image courtesy of Atlantic Gold Corp.
Atlantic Gold (TSXV: AGB; US-OTC: SPVEF) says recently completed diamond drilling at its Cochrane Hill gold deposit in Nova Scotia is confirming mineralization extensions initially defined in its 2018 phase three resource definition drill program. Highlights from the latest resource extension drill program include 11 metres grading 43.65 grams gold from 227 metres downhole including 1 metre at 466 grams gold and 7 metres at 23.69 grams gold from 285 metres downhole including 1 metre at 153 grams gold. These results come from recent drilling at Cochrane totalling 16,242 metres across 70 holes. The results come from recent drilling at Cochrane totalling 16,242 metres across 70 holes. The company completed its phase three drill program at Cochrane in January 2018, drilling 6,900 metres across 44 holes. The results from that drill program, however, are not yet included in Cochrane’s resource. Cochrane contains 10.66 million measured and indicated tonnes grading 1.16 grams gold for 398,000 oz. gold as well as 1.63 million inferred tonnes at 1.32 grams gold for 69,000 oz. gold. It sits 80 km northeast of the company’s central processing facility at its Moose Rive gold mine. Atlantic produced more than 90,000 oz. gold at Moose River in 2018. It expects to produce between 92,000 and 98,000 oz. gold at Moose River in 2019. In mid-January 2019 the company invested $9 million in Velocity Minerals (TSXV: VLC; US-OTC: VLCJF) and now holds a 39.2% interest in the company on a partially diluted basis. Velocity intends to spend the money advancing its Rozino gold project in Bulgaria to feasibility and permitting. Velocity tabled a preliminary economic assessment for Rozino in September 2018 that outlined a $129 million after-tax net present value at a 5% discount rate and a 33% after-tax internal rate of return. The project would produce 65,000 oz. gold per year over six years at $543 per oz. gold all-in sustaining costs. Shares of Atlantic are currently trading at $1.82 with a 52-week range of $1.40 to $1.99. The company has a $431 million market capitalization.